I haven't cooked potatoes in a couple of years. I crossed them off the shopping list when my husband became diabetic. So you can imagine our bliss at Saturday's hashed brown potato lunch...Sunday's roasted potatoes...the unexpected creaminess of Monday's bean and potato soup. I had to research last night's scalloped potatoes. Using a boxed version was verboten, and most of my cookbooks called for Gruyere. I like Everyday Food's method over a specific recipe. I was able to slice just enough to fill a small glass casserole. The last thing I want is leftover potatoes! Potatoes in our near future: hot potato salad, mashed potatoes, corn and potato soup, followed by baked potatoes. Anyone else wonder why this menu is so packed with potato goodness? I think it's just that they've always been the cheapest food out there and previous generations hadn't been through the Atkins fad so they didn't think of them as poison. They're cheap, they store well and can be grown in almost all climates so most folks had access to them. I was looking at my grandmother's recipes the other day. Over half of them are potato-based! Scotch-Irish pig farmers, but still!!! I realize diabetics have to be careful about eating potatoes (what is your husband eating in place of the potato dishes? )but they are full of nutrients in spite of the bad rap they receive these days. When I was growing up in the 1950s in a poor rural family, we always had an abundance of home-grown potatoes and my mother served potatoes in some form almost every day. I still love potatoes and eat them a couple of times per week. In moderation, I think they are healthy. I must admit that hot potato salad doesn't sound too appealing to me, but a bowl of creamy mashed potates - yum! I would not feed my children French fries (because of the frying) but I encourage a baked potato. Yes, I was just thinking that so many Americans eat french fries everyday....so perhaps a week of potato dishes isn't out of the ordinary! My husband is taking just a taste of the potatoes and then filling up on the other vegetable(s). Last night I cooked a can of asparagus instead of the corn because that starchy combination was just too much! I believe sweet potatoes are actually lower on the glycemic index. Are they allowed for diabetics? I like to make oven fries using either white or sweet potatoes. Just cut to size, toss in a bowl with a bit of olive oil, spread on a cookie sheet, season, and bake till done. I've also noticed some soup recipes using sweet potatoes. We have scalloped potatoes here often. They are so easy to make. My husband has type 1 diabetes. We eat potatoes in this house several times a week. It is a 'staple' here. My husband just does not eat much of them. He is a man over 6ft tall and he has just a 1/2 cup serving. Then he eats lots of other things. Like salad, broccoli etc. I make simple scalloped potatoes with some left over ham chunks after Thanksgiving, Christmas, Easter...anytime really that we have ham...we love it. Thanks for the menu from the 50's. It is like a trip down memory lane. It all sounds yummy!! I am still amazed that you could stretch a roast so far. We eat organic potatoes about twice a week or more. We switch between that and brown/white rice as our starch. We use them in Sheperd's/cottage pie (mashed potato tops ground beef and veggies in a gravy). Fish and chips (slice and soak in warm water for 15 minutes, then toss with olive oil and bake 450 in oven for 15). Potato soup or baked potatoes or sliced in a spare rib soup. Cottage potatoes in the oven for breakfast (see Better Homes and Garden cookbook) using leftover bacon drippings, yummy. Also I have used leftover potatoes for refrigerator potato dough (I don't recommend the doughnut recipe but the breadstick and rolls were good). Cheap and filling! I make scalloped potatoes with leftover ham, chopped fine, sprinkled in every layer. Yum! Will your husband be able to tolerate the potatoes? Potatoes are one of those frugal and nutritious foods (plus they taste way better than lentils). Just like rice and bread, potatoes are acceptable food for diabetics as long as they are eaten in moderation and paired with a protein. Thanks for posting the week's 1950's menu - it's been very interesting to watch! Meredith - I'm loving this series. At the top of my list is to sit down and reorganize our grocery budget. Actually I've been planning to do it for weeks now and things have been so crazy that I haven't made time to. The Donna Reed menus are a great motivator. How are you enjoying cooking this way? This whole series has been interesting. We bought a 1/4 beef steer this year so have been having beef alot and all the suggestions for leftover roast are very useful for me! Also I have a 10 lb bag of potatoes I'm trying to use up, I grew up eating potatoes a lot but my husband is Filipino so wants rice and my 3 y.o. is usually the same. I really enjoy visiting your blog(sometimes twice a day or more:~) and listening to your podcasts. I have been reading your archives because even though I have been a reader for a while I wanted to go back and read the posts I missed. I have gotten so many good ideas and book recommendations. I appreciate your willingness to share your heart and inspiring me to make my home a haven. I'm was raised on potatoes about evey day, raised my 4 sons on them, and I can't imagine not having them. We still cook this way, being Appalachian. These menus sound normal to me! I grew up in Ireland and ate potatoes at least 3-4 times a week, often more. I think they are popular because they are so cheap, and versatile and can keep for a reasonably long period of time. I love potatoes in almost any form, but champ is probably my favourite. I discovered something wonderful right after the holidays that I want to share. I rarely serve potatoes for my family because of the carb factor, but had bought a big 10 pound bag of Idahoes for holiday entertaining. Among other uses, I made a rich potatoes au gratin casserole for one of the "guest" dinners. It was delicious and a hit, but there was still tons left in the casserole even after a couple days of leftovers. I ended up freezing two cottage cheese containers of the au gratin thinking I would dump it in with a stew or roast down the road. Then, a week or so later I saw a recipe for potato corn chowder. And what were the main ingredients, you ask? Why, potatoes and cheese and onions and sesonings pretty much exactly like the frozen ones I already had. I made a bechamel with butter, flour, and milk, dumped in the thawed potatoes and simmered. The chowder was heavenly. Just so tasty, and the potato starch added additional thickness to the chowder. I'm really enjoying reading about your nostalgic 1950s cooking. It's inspired me to pull out my grandmother's 1947 edition of The Good Housekeeping Cookbook. When I saw the title one potato, 7 days I thought "surely that cookbook can't stretch one potato to last 7 days!!" Diabetics can learn to count carbs and incorporate them into their diabetics diets in moderation. Leigha, you are right that diabetics can eat carbs when counted--but it is still MUCH better to choose carbs with high fiber, like green and yellow vegetables, over white, starchy carbs like potatoes. A diabetic can technically eat anything in moderation, but my husband finds that all starchy products, be they bread or potatoes, raise his blood sugar much quicker than other types of carbs. I love to make potato rolls out of leftover mashed potatoes. My family loves them! You can find the recipe in the Betty Crocker cookbook. My husband and daughters (ages one and three) think this is the best bread ever. It's very moist and dense. Meredith - just a curious comment - I've often wondered when you've mentioned your husband's diabetes - is it Type 1 or 2? Does he take any medications at this point or just diet and exercise? I've noticed you're very careful to provide low-carb options as much as you can, but I wondered if he was doing anything else besides cutting carbs. I have Type 1 myself and am now a three-month pumper. I've never been one to limit my carbs, so the insulin pump has been amazing for me - matches the necessary insulin to the amount of carbs you're eating and, voila! What my silly pancreas is supposed to do by itself. Others have mentioned the cheapness of potatoes, as well as the long storage capability, & I think they're right. Also, foods go in & out of fashion just like so many other things. The 1950's just WAS a big "meat & potato" decade. This is the same "recipe" for scalloped potatoes that my mother taught me years ago. Sometimes I add chopped leftover ham or leftover roast beef or leftover chicken to the layers, or use up a little bit of grated cheese left from another recipe. You could also add chopped bell pepper, pimentoes, olives, mushrooms, to give it a different flavor. That's easy. 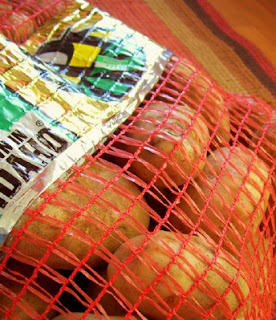 Potatoes are cheap filling, and store well for long periods of time. Back in the day when this menu was written, people didn't eat as much junk (including things like packaged rice mixes and other stuff we now think of as regular old food) and didn't lay around as much vegging, watching tv, gaming or being online. All those potatoes were not only cheap, but not nearly as unhealthy as they would be today when they're piled on top of all the other sugary stuff we consume that's burned quickly, leaving the potato excess to build up in our bods. If we got rid of the rest of that stuff, we'd probably find we could eat all the potatoes (not French fries!) we'd desire. I know why OUR home is heavy on potatoes. Our firstborn is allergic to wheat, eggs, peanuts, peas, kidney beans, and nuts...and those are just his allergies to food! Once you find the health food store option that is palatable, you're still crying at $5 loaf of bread you're buying. (Baking with wheat and egg substitute is very strange and follows no rules on top the expense.) So I am very thankful for the inexpensive and healthful potato! (We also eat quite a bit of rice.) The skin redeems it somewhat and Mom is in charge of the additional ingredients that go in. The inexpensiveness of rice and potatoes help offset the price the few specialty items he does get and keeps the budget in one piece. This is exactly the scalloped potato recipe that I was taught by MY mother and grandmother. That is how they were made. When I was growing up in the 60's and 70's, my Grandpa was a meat and potatoes man. Probably a holdover from the 50's. How is your husband's blood sugar fairing the face of all of that starchy goodness? Or is he just eating small portions? Oops...didn't read the comments before I left mine. Sounds like your hubby is faring just fine! I feel guilty even having all those potatoes on the menu, even if he only takes a small portion and fills the rest of the plate with the meat and non-starch vegetable. He is Type II and manages his blood sugar extremely well with diet and Metformin. When I was a child (not that long ago), my mother would plant all of the potatoes from the bag that sprouted before she could cook them. We had free potatoes for months! Pretty frugal if you ask me! The recipe my mother and I have always used for scalloped potatoes comes from a now "vintage" Betty Crocker cookbook. Everyone raves over them when I make them for company. There is no cheese in the recipe, but the potatoes are layered with onions sauted in butter, and a simple white sauce made with butter, all purpose flour, salt, pepper and milk. I browns beautifully on top and has a wonderful flavour. It's also incredibly cheap to make! If your husband likes to eat green and yellow vegetables over potatoes, that is a healthy choice. However green and yellow vegetables are very low in carbs, and are considered more of a source of protein than carbs. I guess the question with potatoes and breads is not "Are they okay in a diabetic diet?" but "Can you stop with the one small portion counted on the meal plan?" My husband has found that the answer, for him, is usually NO. His team of dieticians and doctor approve of his eating plan and compliment him regularly on his tight control using minimal medicine. So far he has shown no negative effects. My family loves pototoes more than rice or pasts. They're a true comfort food! My niece takes 2 teaspoons of organic apple cider vinegar in water before every meal -- her Dr. told her that this "old time" remedy is helpful in keeping blood sugar normal -- and she has also slowly lost some unwanted pounds! Your husband might want to check this out... since I once worked for a Dr. I no longer want to put chemicals in my body if there is another [and usually better]way to get the right results. I just finished testing box graters for one of the food magazines. We shredded about 6 pounds of potatoes on 14 different graters, and our life is one big potatoey goodness festival right now, from hash browns to potato pancakes to potato soup. Everyone loves them, and they're cheap and filling. Needless to say, I think potatoes while may not be good for some people in excess like diabetics etc. they are a whole food, unprocessed and in the form that God created it in, i believe is very healthy! These potatos are in my oven right now. Love this blog!